Keywords: Activation energy, Eucalyptus grandis, Pinus taeda, thermal degradation, thermogravimetric analysis. Bianchi,O. ; Dal Castel, C.; de Oliveira, R.V.B. ; Bertuoli, P.T. ; Hillig, É. 2010. Nonisothermal degrdation of wood using thermogravimetric measurements. Polímeros 20:395-400. Brazil. 2004. NBR 10.007: Sampling of solid waste. Associação Brasileira de Normas Técnicas. Coloma, J.; Reyes, L.; Navarrete, J.; Alarcón, J.; Delgado, L.; Vera, R.; Ubilla, P.; Vásquez, K.; Becerra, J. 2015. Effect of Albino Ophiostoma strains on Eucalyptus nitens extractives. Maderas. Ciencia y Tecnología 17(1):161-170. Dorado, J.; Claassen, F.W. ; van Beek, T.A. ; Lenon, G.; Winjnberg, J.B.P.A. ; Sierra-Alvarez, R. 2000. Elimination and detoxification of softwood extractives by white-rot fungi. Journal of Biotechnology 80:231-240. Guo, X.; Wang, S.; Wang, K.; Liu, Q.; Luo, Z. 2010. Influence of extractives on mechanism of biomass pyrolysis. Journal of Fuel Chemistry and Technology 38(1):42-46. He, W.; Hu, H. 2013. Prediction oh hot-water-soluble extractive, pentosan and cellulose content of various wood species using FT-NIR spectroscopy. Bioresource Technology 140:299-305. Horowitz, H. H.; Metzger, G. 1963. A new analysis of thermogravimetric traces. Analytical Chemistry 35:1464-1468. Ishida, Y.; Goto, K.; Yokoi, H.; Tsuge, S.; Ohtani, H.; Sonoda, T.; Ona, T. 2007. Direct analysis of phenolic extractives in wood by thermochemimolysis-gas chromatography in the presence of tetrabutylammonium hydroxide. Journal of Analytical and Applied Pyrolysis 78:200-206. Islam, Md.A. ; Asif, M.; Hameed, B.H. 2015. Pyrolysis kinetics of raw and hydrothermally carbonized Karanj (Pongamia pinnata) fruit hulls via thermogravimetric analysis. Bioresource Technology 179:227-233. Kilulya, K.; Msagati, T.A.M. ; Mamba, B.B. ; Ngila, J.C.; Brush, T. 2014. Effect of site, species and tree size on the quantitative variation of lipophilic extractives in Eucalyptus woods used for pulping in South Africa. Industrial Crops and Products 56:166-174. Pétrissans, A.; Younsi, R.; Chaouch, M.; Gérardin, P.; Pétrissans, M. 2014. 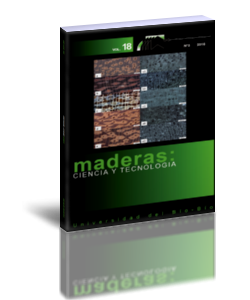 Wood thermodegradation: experimental analysis and modeling of mass loss kinetics. Maderas-Cienc Tecnol 16(2):133-148. Poletto, M.; Dettenborn, J.; Pistor, V.; Zeni, M.; Zattera, A.J. 2010. Materials produced from plant biomass. Part I: evaluation of thermal stability and pyrolysis of wood. Materials Research 13(3):375-379. Poletto, M.; Zattera, A.J. ; Forte, M.M.C. ; Santana, R.M. 2012a. Thermal decomposition of wood: influence of wood components and cellulose crystallite size. Bioresource Technology 109:148-153. Poletto, M.; Zattera, A.J. ; Santana, R.M. 2012b. Structural differences between wood species: evidence from chemical composition, FTIR spectroscopy, and thermogravimetric analysis. Journal of Applied Polymer Science 126:E336-E343. Poletto, M.; Zattera, A.J. ; Santana, R.M. 2012c. Thermal decomposition of wood: kinetics and degradation mechanisms. Bioresource Technology 126:7-12. Popescu, M.C. ; Popescu, C.M. ; Lisa, G.; Sakata, Y. 2011. Evaluation of morphological and chemical aspects of different wood species by spectroscopy and thermal methods. Journal of Molecular Strucuture 988:65-72. Sanchez-Silva, L.; López-González, D.; Villaseñor, Sánchez, P.; Valverde, J.L. 2012. Thermogravimetric-mass spectrometric analysis of lignocellulosic and marine biomass pyrolysis. Bioresource Technology 109:163-172. Saputra, H.; Simonsen, J.; Li, K. 2004. Effect of extractives on the flexural properties of wood/ plastic composites. Composite Interfaces 11(7):515-524. Shebani, A.N. ; Van Reenen, A.J. ; Meincken, M. 2008. The effect of wood extractives on the termal stability of different wood species. Thermochimica Acta 471:43-50. Shebani, A.N. ; Van Reenen, A.J. ; Meincken, M. 2009. The effect of wood extractives on the termal stability of different wood-LLDPE composites. Thermochimica Acta 481:52-56. Sheshmani, S. 2013. Effects of extractives on some properties of bagasse/high density polypropylene composites. Carbohydrate Polymers 94:416-419. Silvério, F.O. ; Barbosa, L.C.A. ; Maltha, C.R.A. ; Fridêncio, P.H. ; Cruz, M.P. ; Veloso, D.P. ; Milanez, A.F. 2008. Effect of storage time on the composition and content of wood extractives in Eucalyptus cultivated in Brazil. Bioresource Technology 99:4878-4886. Slopiecka, K.; Bartocci, P.; Fantozzi, F. 2012. Thermogravimetric analysis and kinetic study of poplar wood pyrolysis. Applied Energy 97:491.497. Tenório, C.; Moya, R. 2013. Thermogravimetric characteristics, its relation with extractives and chemical properties and combustion characteristics of ten fast-growth species in Costa Rica. Thermochimica Acta 563:12-21. Toscano, G.; Duca, D.; Rossini, G.; Mengarelli, C.; Pizzi, A. 2015. Identification of diffetent Woody biomass for energy purpose by means of Soft Independent Modeling of Class Analogy applied to thermogravimetric analysis. Energy 83:351-357. Wongsiriamnuay, T.; Tippayawong, N. 2010. Thermogravimetric analysis of giant sensitive plants under air atmosphere. Bioresource Technology 101:9314-9320. Zhang, J.; Chen, T.; Wu, J.; Wu, J. 2014. Multi-Gaussian-DAEM-reaction model for thermal decompositions of cellulose, hemicellulose and lignin: comparison of N2 and CO2 atmosphere.